As a crafter, I try to express my gratitude with a something handmade. That is a lesson my Mom taught me from a young age. You say your please and thank-you's, you send a thank-you card and you never show up to someones house empty handed. You take a bottle of wine or a host gift. This does not include the salad that you offered to bring. That too is well mannered, but not the same. You need to take something special to the host. Something for them, to tell them you are thankful to them for having you to their home and to tell them that you love them. It does not have to be a $100 bouquet of flowers or a bottle of Cristal. (Although, you could bring that to my house if you really felt it necessary). If you are reading my blog I would like to bet that you are crafty? I know my craft room holds a value as much as a wine cellar full of Cristal. Put it to good use! Make a handmade card, a gift tag for an inexpensive bouquet of flowers or treat container for their favorite candy or chocolate (I am sure you have a Pinterest board full of those kinds of ideas). Our busy lives can mean that it is hard to fit it all in, I get it. Buuut ... don't you love a little surprise, don't you love to know you are appreciated and loved? We all do! This year I started sending Birthday Cards to my friends a family each month. It is on my to do list each month and I sit down and get it done. I can say that the payoff is worth it. I am constantly getting messages of thanks from the recipients. It feels so wonderful to make them feel special! How often do you surprise someone with a thank-you or random act of kindness? 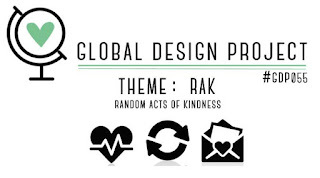 Take the Global Design Project Challenge this week! You will feel so good and will be happy that you did! It just happens that we have been invited to dinner at our friends home this week. They have a six month old little girl and I found the cutest little mittens at the dollar store. I will wrap these up with my card and I am going to pick up an autumn bouquet of flowers at the grocery store on my way over. I hope that you have been inspired to take the challenge this week. Have a wonderful week spreading some love my friends! Comment below if you have a story to share about your random act of kindness.